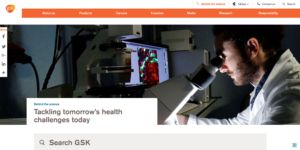 I’ve been waiting a while to be able to talk about the new gsk.com. GSK came to us over three years ago to help them create a design and UX ecosystem that they could roll out across the world. Mid 2016 when the GSK ecosystem was approx 2 years old, they came back to us to create version 2.0 of their dot com. The challenge was to create a new front end with functionality edits to specific areas that they had identified as requiring a better user experience. I was heavily involved in the strategy, usability testing, stakeholder presentations and the UX. I’m loving the new site and I hope that they can add this to their ecosystem and see this rolled out to its current 50+ sites that are already on gsk ecosystem 1.0.